Mario Moreno, better known by his stage name of Cantinflas (pronounced cahn-TEEN-flahs) is a comedic legend. He is more than 'the Chaplin of Latin America'. In a great example of genius influencing genius, Cantinflas took some Chaplin characteristics (the raggedy clothes, the expressive face) but unlike Chaplin, Cantiflas' greatest strength was his ability with words. He could turn a simple sentence into something so complex and convoluted that a term was coined for someone who befuddled with linguistic prowess: to "Cantinflear" means to so confuse someone with verbiage that it becomes too confusing. In return, Charles Chaplin commented that Cantinflas was the greatest comic alive. I had grown up watching Cantinflas movies, but this was the first time I had seen one of his most legendary films, El Bolero de Raquel. An obvious pun on Ravel's Bolero, Cantinflas turned the iconic piece and made something both universal and specific to its setting. 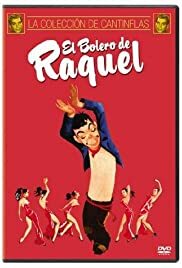 Granted, those who speak or understand Spanish will appreciate it better than those who don't , but with or without subtitles El Bolero de Raquel is a delight. In this, Cantiflas' first color film and the first after his brief foray into the American market with mixed results (the Oscar-winning Around the World in 80 Days followed by the disastrous Pepe), El Bolero de Raquel is a welcome return to form for a true comedic genius. Cantinflas plays a 'bolero' (basically, a shoeshine boy), who scrapes a living by both shining shoes and hoodwinking clueless American tourists with his own bizarre history lessons on Chapultepec Palace. He returns to his neighborhood one night to discover that his best friend has died by falling off the construction site he was on. The widow, Leonor (Flor Silvestre) decides that she will go to her parent's home and plead for help, for her parents objected to her marriage. As such, she leaves her son Chavita (Francisco Fernandez) in his care while she's away. Cantinflas wants to do right by his godson, so he tries to get an education, where he falls for Chavita's schoolteacher, the beautiful Raquel (Manola Saavedra). That doesn't go very well (when Cantinflas is asked to explain what shapes water takes, he says two: Major and Minor, expanding that Major Water is things like oceans, Minor Water being what you find in fountains and sinks). An effort to be in construction also flops spectacularly, as does the highlight of the film. He gets a job shining shoes for a cabaret show, and when the headliner goes on stage to perform a dance to Ravel's Bolero, he hears it as her calling for the 'bolero' to join HER on stage. Finding no prospects in Mexico City, they go to Acapulco, where he tries to make money off the tourists, but again things go wrong. He stumbles (quite literally) into a lifeguard job, but he proves typically inept (the large woman floundering in the ocean ends up rescuing him!). They go back to Mexico City, but with enough money for Cantinflas to get Chavita what he's always wanted: a large ball. When they arrive at the neighborhood, to their surprise Leonor has returned, having not only made peace with her parents but with a fiancée who is glad to take Chavita with them, and who comes bearing his own ball. Cantinflas, sad to see Chavita go but resigned to it, begins to wander with his ball, and at a park kicks it away, only to find Raquel has picked it up. She had fallen in love with Cantinflas, and we end with them together. Cantinflas has a great ability to be hilarious and heart-tugging at the same time. His verbal skills are in top form throughout El Bolero de Raquel. Showing up intoxicated at the funeral with a mutual buddy (where no one appears to think it odd and goes along with it), as Cantinflas gives a rambling eulogy, he ends up falling into the pit. Cantinflas insists he was pushed. "Well, it's not like he dragged me in," he says in his defense. In Acapulco, Chavita wants to snack on the shrimp they're selling. Cantinflas says no. "What about the seafood you have?" Chavita asks. "That's for sale. Do you want to get poisoned?" he replies. The sight gags are also hilarious. The naughty but still clean pleasure he gets in putting sunscreen on American tourists is extremely funny. At one point, having poured some on a slightly elderly woman, he then finds that she calls her granddaughter. He insists on being thorough and tells them he'll be back tomorrow. What makes his efforts at seduction more amusing is that somehow we know he won't ever get far (his voice rises like that of a teen discovering girls for the first time). There is a certain innocence to Cantinflas' persona, but one mixed with shrewdness. While at the zoo, Cantinflas manages to get snacks for himself and Chavita by pretending to help a fat boy in a sailor suit 'feed the monkeys' by tossing them peanuts and taking oranges and bananas in the guise of tossing those. The dance is also hilarious, showing off a physical dexterity to rival Chaplin. It also brings up the cliché of every Mexican film having to have a cabaret scene. Going back to Chaplin, El Bolero de Raquel seems to have a bit of The Kid in it, with Cantinflas having to play a father-figure to the youngster. Unlike Chaplin's version however, Cantinflas is not a reluctant father. Furthermore, the idea of the 'padrino' or godfather is stronger in Latin America, where a man who is not the biological father assume fatherly responsibilities he promised to at the child's baptism is taken more seriously. However, that is as serious as El Bolero de Raquel is, because both physically and verbally Cantinflas is a master. From his bizarre chemistry and history lessons to his ability to outwit the police, we get the comedic side. When he and Chavita offer prayers at bedtime, we get the sentimental side (though still with great humor and heart). Ravel's Bolero is built around its deliberate repetitiveness, which enhances its brilliance. El Bolero de Raquel is built around Cantinflas' verbal and physical abilities along with a tender element of fathers and sons, which enhances its brilliance.